Speaker of the House of Representatives Mohamed Halabousi discussed Monday with the Speaker of the House of Commons the file of contribution to the reconstruction of Iraq. 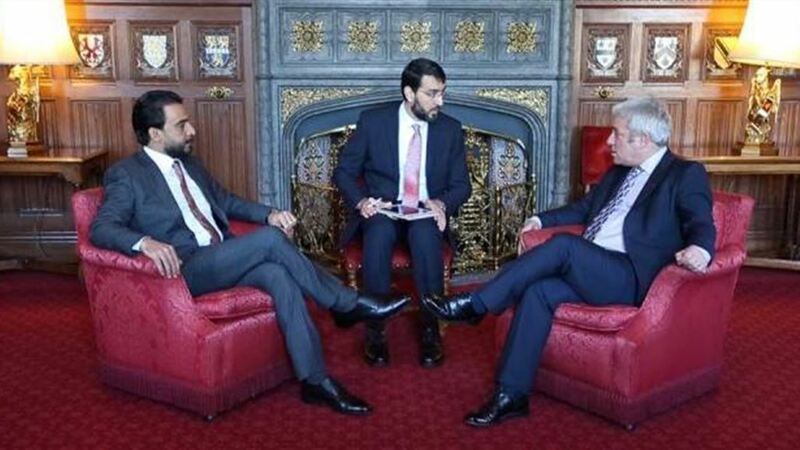 Al-Halbusi said in a statement received by Al-Alsumaria News that the latter met "in London, the Speaker of the British House of Commons, John Berko," explaining that "the meeting discussed the strengthening of bilateral relations between the two countries and the activation of parliamentary friendship committees, Democracy and the development of parliamentary action ". The statement added that "the file was discussed to contribute to the reconstruction of Iraq, and benefit from the expertise of British companies in this area," pointing out that "the President of the House of Representatives invited John Birko to visit Iraq." For his part, welcomed Berko, according to the statement, "the visit of the Speaker of the House of Representatives to the United Kingdom, and blessed the great victories achieved on the supporter of the terrorist," again "continue to provide all the necessary resources to support Iraq in all areas."